The KMPlayer 3.9.0.125, or K-Multimedia Player download for Microsoft Windows, is a video and audio player for Microsoft Windows which can play a large number of formats such as VCD, DVD, AVI, MKV, OGG, OGM, 3GP, MPEG-1/2/4, WMV, RealMedia, FLV and QuickTime among others. It handles a wide range of subtitles and allows one to capture audio, video, and screenshots. PC downloaded movies on your Mobile device. Unobtrusive layout: Dark colors and a pop-out settings menu give you clean, uninterrupted access to features like subtitle management, brightness/contrast adjustments, and frame captures. Full video codec support: Similar to video players like VLC and GOM, KMPlayer is a universal media player that can tackle just about any format you throw at it. 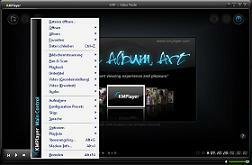 Mobile compatibility: KMPlayer’s companion app works with the desktop player. You can stream local videos to your mobile device via Wi-Fi if you have the Connect app installed on Android or iOS. Display heavy: KMPlayer is not a standalone video player, so it encourages content discovery via partnerships with some third-party apps. The result is a preview-heavy player that throws ads and links at you constantly.